The Grassmarket area in Edinburgh is one of the liveliest parts of the city, with plenty of bars and restaurants, and a buzzing weekend market. Steeped in history, the cobbled Grassmarket area sits in the shadows of Edinburgh Castle. For nearly 500 years, this was one of Edinburgh’s main market places for horses and cattle. Now, it’s a hub for pubs, bars and restaurants. A perfect place for holiday-makers to visit when staying in our nearby holiday homes. There are still frequent markets, but today they sell local produce and arts and crafts. The area is also a great venue for live music and events. The Grassmarket provides a unique shopping experience in the heart of Edinburgh's Old Town. With lots of independent shops to explore, you'll find vintage clothing, hand-made gifts, locally produced food and drink, and more. Then, after a busy shopping session, relax in one of the Grassmarket's traditional pubs, or grab a bit to eat in a cafe or restaurant. There are lots to choose from! Over the course of the year, the Grassmarket hosts several outdoor events. From the weekly market each Saturday, to one-off celebrations. The annual Mardi Gras event in the Grassmarket sees the area transformed into New Orleans for one day each July. During the Festival Fringe in August, you'll find street performances, live bands and entertainment. And at Christmas, the Grassmarket offers late-night shopping and family-friendly activities. From 1477 to 1911, this Medieval square was a major market place in Edinburgh, where traders would buy and sell horses and cattle. The name Grassmarket comes from the grassy pens where the livestock grazed. It was also once a place of execution. A round stone known as the “shadow of the gibbet” marks the spot where hangings took place in the 17th and 18th centuries. As a busy trading area, several taverns and lodgings were built around the Grassmarket. The buildings standing today date from the 17th to the 21st century. They are still used as shops, pubs and hotels to this day. And there is still a weekly market, which today sells locally made gifts and foods. 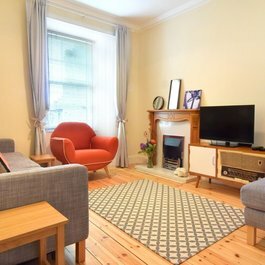 If you're still looking for self-catering holiday accommodation in Edinburgh, then look no further! 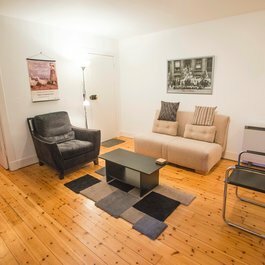 Here at Lets Get Local, we have a beautiful collection of properties near the Grassmarket area in Edinburgh. Please take a look and don't hesitate to contact us if we can help you plan your trip. Fed up with mainstream fashion? Looking for something innovative, exciting and bold? Whisky was invented right here in Scotland, and today it's our largest and most famous export. After a morning sightseeing and exploring our city’s main visitor attraction, you’ll be in need of somewhere equally special for lunch.